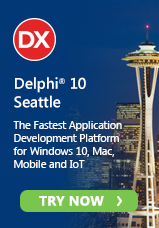 If you purchase RAD Studio, Delphi or C++Builder XE7 during the promo period ending March 31, 2015 you can use the links below to redeem your free software until April 15th, 2015. For the "Buy XE7 get the next version free" offer, qualifying purchases include a free, limited time Update Subscription. You will receive an email notification to access your next version license and download when the next version is released. There is nothing to redeem on that one at this time. Keep in mind that you will need to install and register your XE7 tool before you can access the additional software because the systems check to see that you are a registered user of XE7 and the date range when the license was purchased (where applicable). If you are reading this after the offers have ended, you can always see the latest RAD Studio, Delphi and C++Builder special offers at http://www.embarcadero.com/radoffer. I'm trying to get the free enterprise mobility services licence but I'm gettign an webpage telling me that offer has ended ! We are still 31th of mars ! Sorry. Looks like two of them were set up incorrectly. One has been fixed already and the other should be soon.